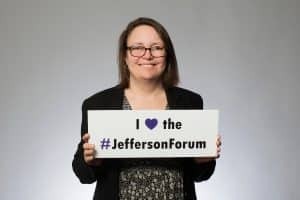 The 4th Annual Jefferson Forum: Creating Our Story, attracted 245 participants from 138 organizations on May 9th, 2018 at the Crowne Plaza Pittsburgh South. The daylong conference for community organizations and leaders was designed to help those serving the South Hills and lower Mon Valley communities to experience and engage the power of storytelling. Participants had the opportunity to learn and network with other passionate individuals working to improve the Jefferson area. Participants rated this event highly, noting insightful speakers, helpful workshops, creative activities, and wonderful opportunities to engage in important conversations that do not regularly happen. 100% of Forum participants found the event to be productive, and 100% of attendees responded that they are likely to attend another Forum in the future! An inspiring keynote presentation by Stephen Smith (Author and Director of the West Virginia Health Kids and Families Coalition) on the importance of grassroots organizing based on his own experiences in a diversity of locales. A panel of local Speakers – Todd DePastino (Veterans Breakfast Club), Julie Strickland-Gilliard (Global Links), Ashley Potts (Allegheny Health Network, Center of Excellence for Opioid Use Disorders) and Khara Timsina (Bhutanese Community Association of Pittsburgh) – who told personal stories of the passions, experiences, and struggles that have shaped their lives and careers. Interactive and skill-building workshops on: Building Sustainable Organizations, Building Advocacy from the Grassroots, Improving Outcomes through Language Access, Motivational Interviewing Basics, The Challenge of Addiction, and Mindfulness Practices. A performance of select scenes from The Way Out: a powerful new play that educates on the issue of opioid abuse by Saltworks Theater Company. Opportunities for participants to share their stories and passions at the Photo Booth during breaks throughout the day. View and Download Photos from the Forum’s Photo Booth Here! A powerful photo exhibit featuring immigrant and refugee teenagers from South Hills Interfaith Movement, and their stories of culture, identity, and resilience. The Jefferson Café, which enabled attendees to participate in three rounds of table discussions, geared towards discussing challenges and potential solutions. A summary of themes and interesting ideas that emerged from these conversations can be viewed here. The launch of the 3rd Edition of the Jefferson Community Directory, a resource guide for making connections in the South Hills and Lower Mon Valley. The new addition includes more than 60 new programs, two new categories of services (Immigrant & Refugee Services and Workforce Development), and new consolidated listings for Libraries and Family Support Centers within the Jefferson area. All Forum attendees received a hard copy of the directory. The Directory is also accessible online with clickable links here.